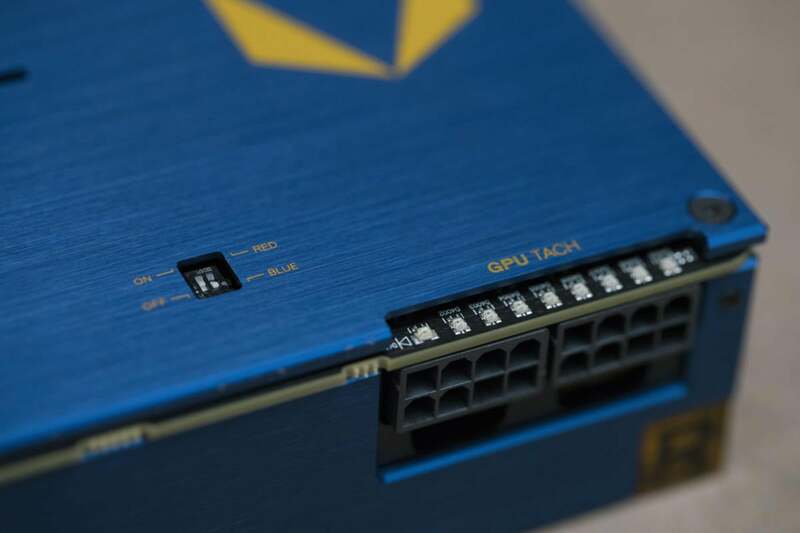 The first Vega card rips through a workstation benchmark and a few games, too. AMD’s Radeon Vega Frontier Edition may be a graphics card for workstations, but gamers are just as eager to see what this GPU can tell us about the coming consumer version. AMD has already made a splash with its Ryzen and Ryzen Threadripper CPUs, and now Vega can help complete a high-performance puzzle. To show how the Radeon Vega Frontier Edition could benefit workstations, AMD officials gave us a hands-on preview of one of the first production cards. 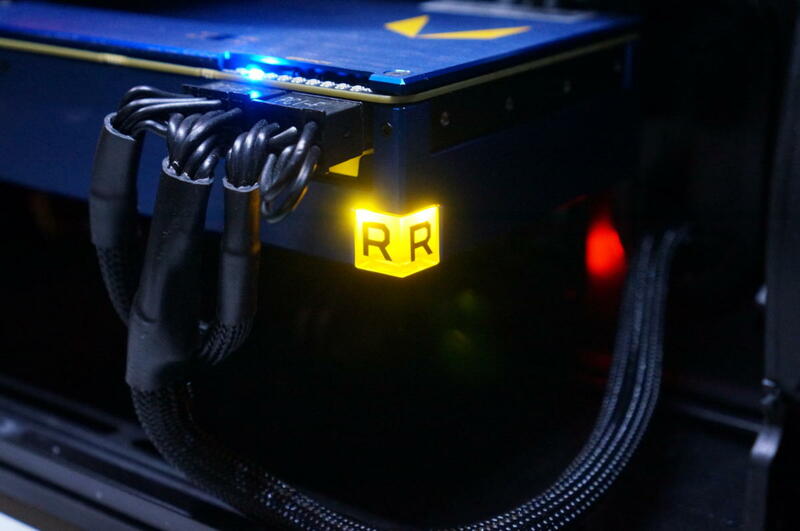 AMD’s Radeon Vega Frontier Edition features a glowing yellow ‘R’ and blue-LED indicators that match the GPU utilization. We’ve published full details on the Radeon Vega Frontier Edition, but here’s the short story: The Frontier Edition is based on AMD’s new Vega core and features 16GB of advanced HBM2 RAM. And it’s a doozy in every way possible: The air-cooled card will cost $999, while the liquid-cooled version will cost an additional $500. The air-cooled card we saw has a 300-watt TDP, while the liquid-cooled one demands up to 375 watts. AMD has maintained from the start that the Radeon Vega Frontier Edition is not aimed at gamers, but rather at “data scientists, immersion engineers, and product designers.” What that translates to is a card that, in theory, gives professionals more performance for the money than the pricey Nvidia Quadro competition. 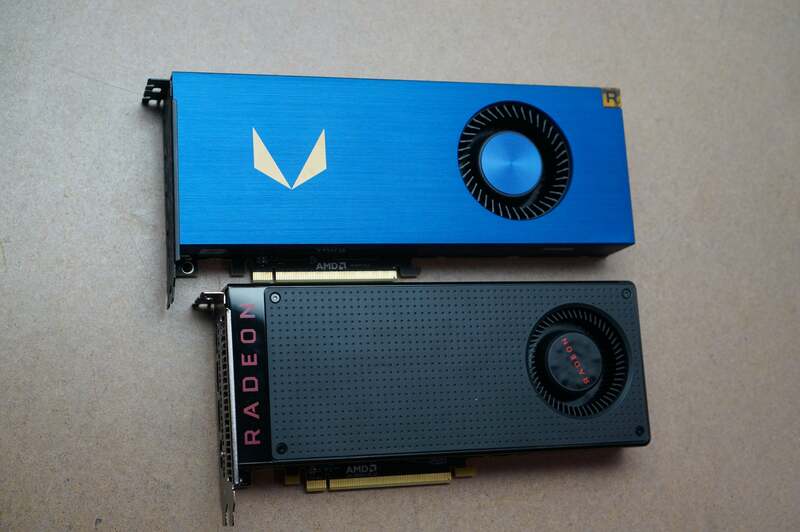 The new Radeon Vega Frontier Edition (top) is slightly longer than the original Radeon RX 480 (bottom). AMD set up two PCs with identical everything: Ryzen 7 1800X CPUs, 32GB of DDR4/2400, SSDs, 4K panels, and even the same mouse and keyboard. Both machines ran Windows 10 Enterprise edition. 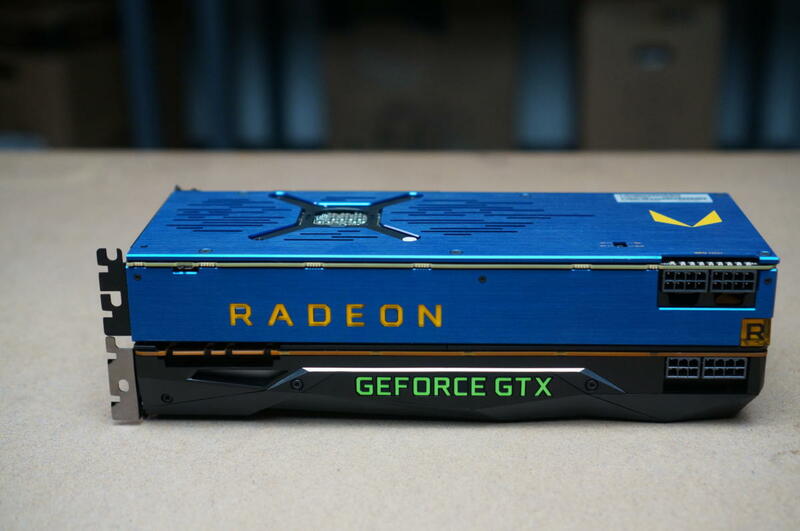 One machine featured the current GeForce Titan Xp, while the second machine ran one of the first air-cooled production-level Radeon Vega Frontier Edition cards AMD has built. And by “built,” we mean built. AMD told us that for Frontier Edition, the lovely blue anodized heat shroud, Radeon logo, and glowing yellow “R” were all finished in California. So, made in ‘Murica—at least the last part. The same isn’t likely to happen with the consumer version, but it’s a nice touch. As much as people want, wish, and imagine Frontier Edition to be the stand-in for a gaming Radeon RX version today, it’s not. AMD’s first demo was a simulated workflow in a design firm. Nvidia’s mighty Titan Xp on the left and AMD’s new prosumer Radeon Vega Frontier Edition on the right. With the Frontier Edition machine running an 8K Dell panel and a second panel at 1080p, plus an HTC Vive, AMD opened up a theoretical car design in the Solidworks engineering application. Panning, spinning, and moving the car looked reasonably fast, as expected. Once the model was “done” and ready to be examined, it was exported using AMD’s ProRender plug-in to Unreal Engine 4, where it could be viewed using the HTC Vive. AMD’s director of professional products, Nick Pandher, said it may seem unusual for a game engine to be paired with an engineering app, but many small- to mid-size design firms actually operate this way today. Unlike the proprietary visualization tools that were once all the rage, off-the-shelf tools use game engines such as Unreal Engine and standard VR gear. People always want to know, “How fast?” For that, we turned to our pair of matching PCs and SPECViewperf, the workstation gold standard for measuring visualization performance on hardware. In the given time we had to run tests, we saw the Frontier Edition outscore the Titan Xp by 28 percent in Catia and Creo to 50 percent in SolidWorks. We also ran Maxon’s Cinebench, a popular OpenGL benchmark, in which the Frontier Edition was about 14 percent faster. The numbers echo what we already knew about the Frontier Edition, but this time we could see the performance demonstrations live. Radeon Vega Frontier Edition is certainly faster in the tests we witnessed, but to be fair, it’s comparing an ostensibly consumer-focused Titan Xp card to the pro-level Frontier Edition. Nvidia’s Titan Xp, for example, officially works only with consumer drivers, while the company’s Quadro workstation products offer a lot more performance. The Radeon Vega Frontier Edition features a GPU tach that communicates the load on the card. The DIP switches to the left let you change the color of the LEDs. That brings us to the disruptive part of AMD’s push: Although powerful, Titan Xp is limited to consumer drivers. To approach the performance of the Radeon Vega Frontier Edition with an Nvidia product, you’d have to step up to at least a $2,000 Quadro P5000. A P6000 card, which is kind of the professional equivalent of a Titan Xp, is nearly $6,000. AMD blames these high prices for driving many prosumers to order workstation-class systems with lower-end professional cards so they can replace them with faster consumer GPUs. AMD believes the Frontier Edition can end this madness and give the company a triumphant return to the professional workstation card game. Note that the Frontier Edition will do so with pro-optimized software support, though the drivers for the Radeon Vega Frontier Edition won’t actually be fully certified. AMD contends that the new GPU design and the HBM2 memory matter as much as the drivers in making Radeon relevant for workstations again. 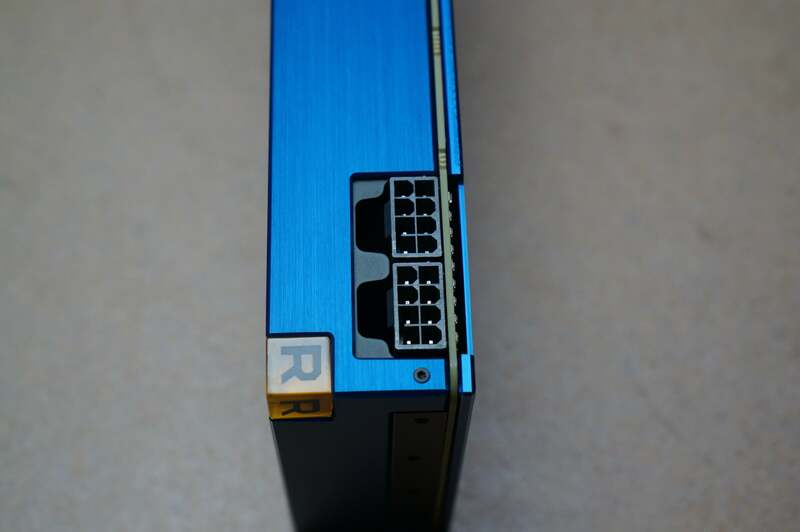 Three DisplayPort 1.4 ports plus an HDMI 2.0 port grace the back of AMD’s new Radeon Vega Frontier Edition card. The Radeon Vega Frontier Edition is a power monger at 300-watt TDP for the air-cooled version and 375 for liquid. Officials tell us the card can be built with a 6-pin, too. While AMD didn’t want to reveal any gaming performance, it agreed to give us a taste of how Radeon Vega Frontier Edition performs in gaming. So we switched out the 8K Dell panel for a pair of Acer 34-inch, wide-aspect 3440x1440 panels, and played games on both the Titan Xp and the Radeon Vega Frontier Edition. To show that it wasn’t just an API advantage, AMD let us play Doom using Vulkan, Prey using DirectX 11, and Sniper Elite 4 using DirectX 12. All of the games were set to their highest game settings, and we played at the native resolution of the panels. Although the identical panels were FreeSync-based, FreeSync was switched off on the AMD GPU. Switching back and forth between the two systems, we’d be hard pressed to tell the difference between the Titan Xp and the Radeon Vega Frontier Edition. While you'd expect such performance from a $1,000 card, many have been concerned that Vega just won’t perform. 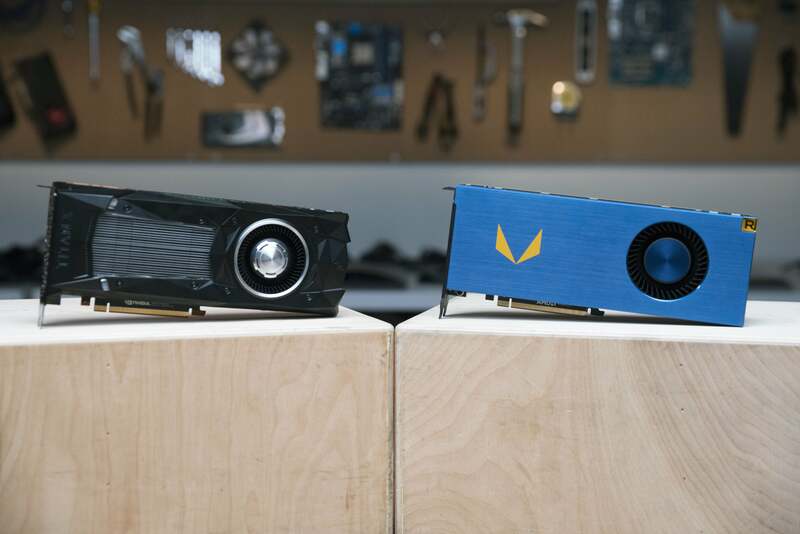 The Radeon Vega Frontier Edition (top) is roughly the same physical dimensions as an Nvidia Titan Xp. From what we’ve seen, that concern is likely unwarranted. Vega FE appears to be plenty fast and, at least for the settings and the games we played, indistinguishable from the competition. Our original estimates after seeing Radeon Vega Frontier Edition with Sniper Elite 4 at Computex still hold: The cards appears to be faster than Nvidia’s GTX 1080 and close to that of a GTX 1080 Ti card. We’ll withhold final judgement until we get our own part to test—the consumer-focused gaming card, most likely. All of the waiting will soon be over: Radeon Vega Frontier Edition cards should begin shipping Monday, and the curtain will finally rise on RX Vega in late July. Update: Although pre-orders for the were set at $1,200 which AMD officials confirmed, AMD now say the pricing of the air-cooled card is $1,000 with the liquid-cooled version set at $1,500.